An Ordinance “TO FURTHER AMEND THE ZONING DISTRICT MAP OF THE CITY OF BIRMINGHAM” (Case No. ZAC2017-00012) to change zone district boundaries from R-3, Single Family District to MUL, Mixed Use Low District, filed by Wayman Newton, representing the owners, Waynew Global Holdings, LLC, for the properties located at 1301 and 1303 20th Street North situated in the NE¼ of Section 26, Township 17-S, Range 3-West, and the hearing of all interested parties. What does this mean? The Public Hearing for this item will now be set for the August 7th City Council Meeting. The proposed use for the location is for professional offices. 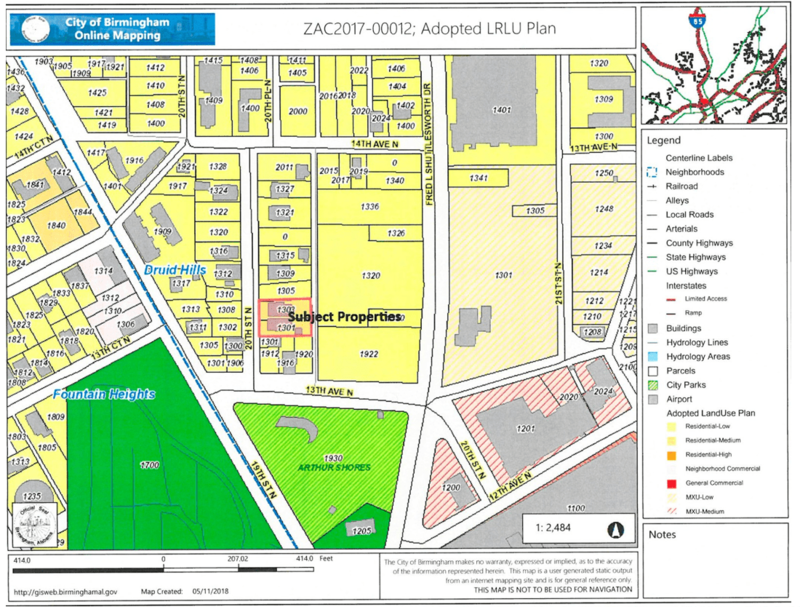 The City’s Long Range Land Use Plan identifies the property as Residential Low, a land use designation most comparable to the existing zoning district, therefore, the rezoning request is Not Consistent with the Plan.The applicant met with The Druid Hills Neighborhood Association at its regularly scheduled meeting on October 23, 2017 to review the proposed project, no official vote was taken. The applicant met again with the neighborhood association at its regularly scheduled meeting on February 26, 2018 to address the concerns of the residents regarding his request. The neighborhood reviewed the proposed request and voted “To Not Recommend Approval” of the proposed rezoning request. Zoning Advisory Committee Action: The Zoning Advisory Committee met at its regularly scheduled meeting on March 6, 2018 and voted to Not Recommend approval of the applicant’s request, and the Planning & Zoning Committee met on May 17th and voted to not recommend the item. What does this mean? The City Council voted to re-appoint Dr. Jayne Ness and Eve Graham to the Jefferson County Intellectual and Developmental Disabilities Authority. The Authority holds a contract with the Alabama Department of Mental Health for Targeted Case Management for adults with a primary diagnoses of an Intellectual Disability. Currently, the Authority serves over 700 individuals, 95% of whom are adults, and 5% of whom are children. A total of 487 of those live in supported residential settings operated by the Authority’s provider, while others live independently or with families. An Ordinance “TO FURTHER AMEND THE GRANTS FUND” for the fiscal year ending June 30, 2018, appropriating $20,808.00 to Fire Department, Community Foundation of Greater Birmingham (CFGB) per grant award received to purchase a vehicle. What does this mean? This appropriation is for a grant to purchase a vehicle to support the Birmingham Fire and Rescues Department’s CARES program, also known as their “Prevention through Intervention” initiative. The program works to reduce the frequency of return ER visits by educating residents about preventative healthcare, instead of patients simply being discharged, not having a primary care doctor to follow up with, and repeating that costly cycle over and over again.